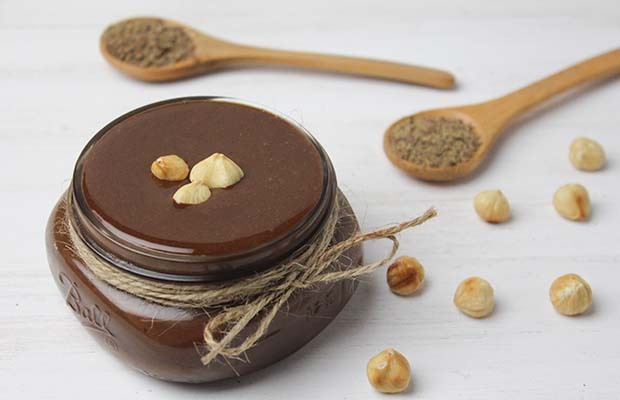 The combination of hazelnuts, chocolate and ground flax is delicious. Tastes great on toast or as a dip for fruit! Preheat oven to 350°F (180°C). Place hazelnuts on a cookie sheet and roast for 8-10 minutes, stirring once. Remove hazelnuts from the pan and add them to the food processor bowl. Using a food processor, process hazelnuts on low for 5 minutes. Add coconut oil and continue processing for another 15 minutes, stopping every 5 minutes to scrape down the sides of the bowl. At the end of 20 minutes the nut butter should be smooth and creamy. Add flaxseed and chocolate chips. Blend 1 minutes to combine. Store in an air tight container at room temperature for up to two month. It probably will not last that long! Yield: 2 cups (500 mL). Serving Size: 2 Tbsp (30 mL). Each serving contains 1 tsp (5 mL) of flax.